The North County Fire Protection District of Monterey County was originally formed on November 21, 1949 as the Castroville Fire Department (CFD). The small department responded to emergencies within and immediately surrounding the township. A 1971 annexation brought Moss Landing and the Elkhorn area into Castroville's jurisdiction. After insufficient revenues closed the Hall Fire District and the Greater Hall Fire District, the area was annexed into CFD in 1972. Two years later, the District increased its Board membership from three to five directors. A 1981 study conducted by the Monterey County Local Agency Formation Commission (LAFCO) concluded that a fully consolidated fire district would provide the most cost effective and operationally efficient fire service from the North Monterey County area. Their recommendations were to consolidate Castroville Fire, Aromas Fire, and Salinas Rural Fire's Station Two area (Prunedale). While Aromas remained independent, reorganization in 1982 implemented LAFCO's other recommendations and the newly reorganized agency was named the North County Fire Protection District of Monterey County (NCFPD). Through the years, NCFPD has enhanced emergency service capabilities while remaining as cost efficient as possible. 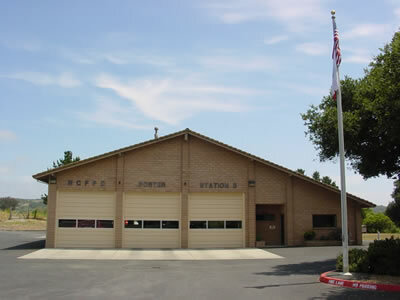 Located in the heart of Castroville, Station 1 was originally built as part of the Castroville Fire Department. Administrative offices can be located here. Located off of Highway 101 and Pesante Road, Station 2 covers some of the most trafficked roadways in the District. With quick access to Highway 101, Station 2 responds from Salinas to Aromas. Station 3 is located on the corner of Elkhorn and Hall roads. They cover the communities of Las Lomas, Royal Oaks, Pajaro as well as parts of Prunedale and Moss Landing.